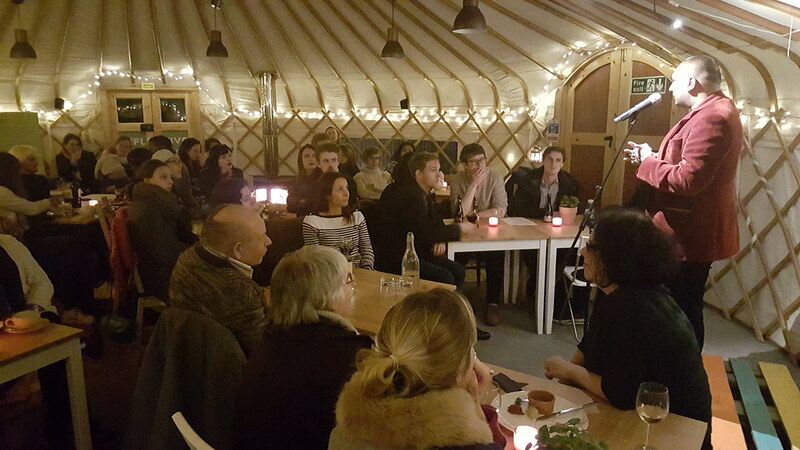 Every third Tuesday of the month we are planning to hold the Yurt Salon — a night of words, and sometimes music, with authors local and not-so-local. It’s a good question how many local authors and poets we can turn up who live or work within walking distance! We hope that this will become a night that will bring them together to share their work, to inspire us and to find inspiration. We hope, too, that this might spill over into unexpected encounters in the yurt cafe as people start dropping by, or becoming part of the WorkHub and joining us on a Wednesday, or through any number of ways we might help create and foster a diverse and supportive creative writing community. Our first Tuesday was an amazing way to kick it all off, mainly through the brilliant efforts of Bobby Nayyar, poet and publisher of Limehouse Books who brought these wonderful poets together and acted as M.C. If you wish to experience the wonderful poetry, albeit at one remove, you can follow the links to their books. Our own Seb opened up the evening, introducing The Royal Foundation of St Katharine and the precinct and all of our greater hopes for this space. I followed with our efforts to collectively create projects through the community and wellbeing hub, and our standing invitation for all to join in or to work with us to start something entirely new. This is, in fact, how I first met Bobby — through one of our community conversation afternoons. 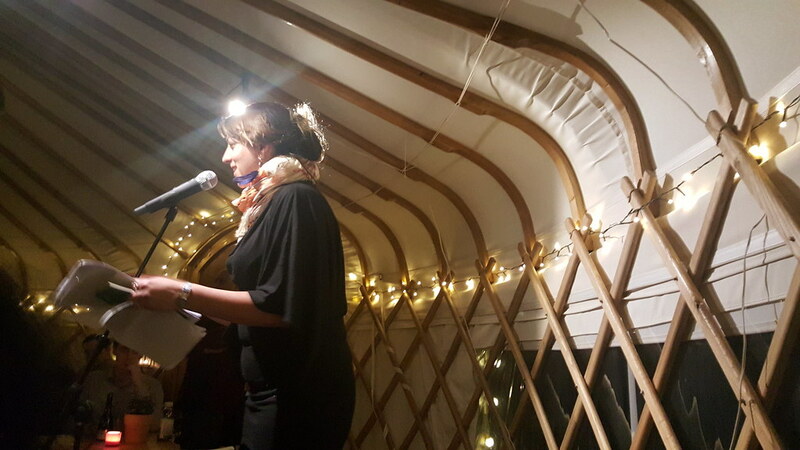 We had a chat about what was possible and thus the idea behind the yurt salon was born. 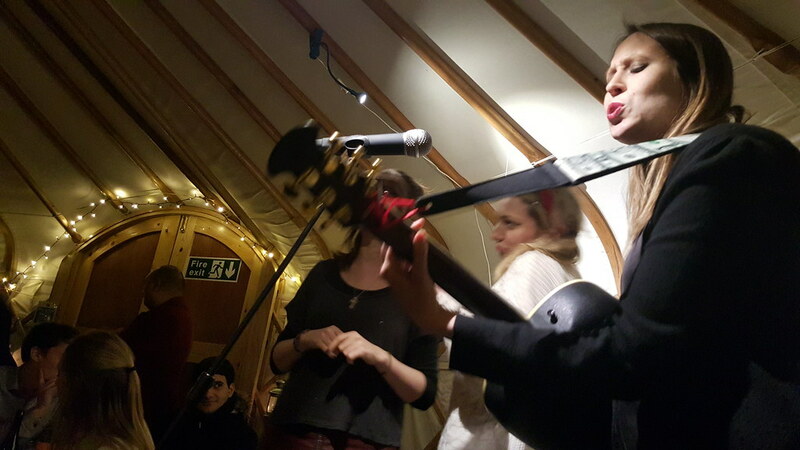 It felt amazing to sit in the yurt less than three months and a Christmas holiday later, remember that afternoon back in November. I remember this as empty ground, and now for the first time the yurt was packed just full enough to be splendid without being so rammed it was unpleasant. Michelle Madsen kicked it off, lively and energetic and jumping and funny. A little sad. She had the crowd in stitches most of the time, the bittersweet laughter shared because everyone there had shared the emotions and experience behind them. But her last poem left a silence. A poignant reflection on the state of the world, it set the change of tone. Gretchen Heffernan was a very different performer altogether. Soft spoken, caught up in her words not the audience. She didn’t play to us, but read quickly. We didn’t always know where one poem ended and another began in time to clap, but her words were beautiful and carried us away. Her last poem I remember best too, on the beach. The wonder at our power to create a human being. Seeing living things in the stones. Then a break! Time for wine, or beer if that was your fancy, or water or juice or the most delicious hot chocolate you have yet tasted, with or without cointreau. And cheese — by plate or baked in a toastie. Bobby started the second set…it is funny to see someone you know and have worked with, transform himself through powerful words that try to express all those things we never talk about in everyday conversation. He succeeded in expressing those things — memory, loss, love. It was, in fact, wonderful. These powerful, short poems poured out…the emotion deflected a little at the end of each one by a joke. Before planning this evening, I had no idea quite how pun heavy it all would be, but it stood in such contrast to the poems from Glass Scissors, whose beauty knocked me over just a bit. 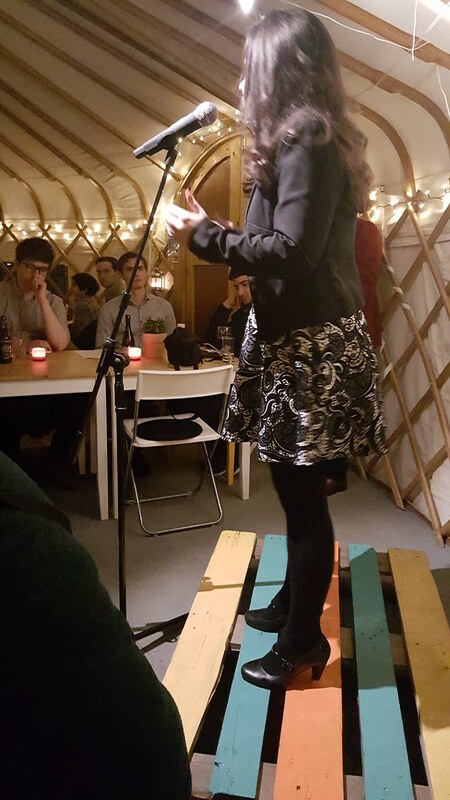 We finished the poetry with Sophia Blackwell, charisma personified there on stage, wearing the most marvelous shoes. 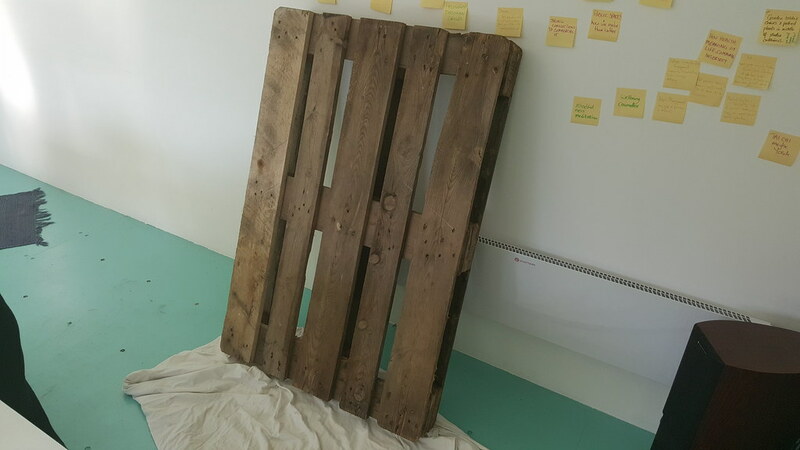 I sat in terror, worried she might fall between the boards of our upcycled pallet stage I had earlier been so proud of. She knew all of her poems by heart, told of love and loss, invited us into her life. She shocked and awed. It was a wonderful finish. Break again! And then the wonderful harmonising of Long Stride Lizzy (who I am afraid I persisted obstinately in calling Thin Stride Lizzy because, well, you know. Thin Lizzy. I can’t apologise enough!) But they are their own, near perfect sound, and you will love them if you love bluegrass or part singing, and have any desire at all to enjoy thoughtful, beautiful often funny lyrics. Another form of poetry. Music was the perfect way to end I think, and they performed an old old song to finish — Green Apples. I imagine they didn’t know it, but Raymond was sat next to me who knew all the words and might well have remembered when it first came out in popular form…it was a gift to him. It made me happy. As did the whole night, we could not have asked for a better start. I was trying to convey how wonderful it was to Carrie Ffoulkes, who is also a poet and part of the team for convening these evenings and sadly unable to make it. I said — I can’t tell if we don’t have to worry too much about future events, or the bar has been set too high. I still can’t tell. But I am so much looking forward to the next one. I am also glad some of the work is behind us, as preparations for the night included much that was new for us. Seb was here for hours the night before setting up the speakers and figuring out the PA system, and working on some spotlights (they looked beautiful I think). Gabby and I worked on a small stage. 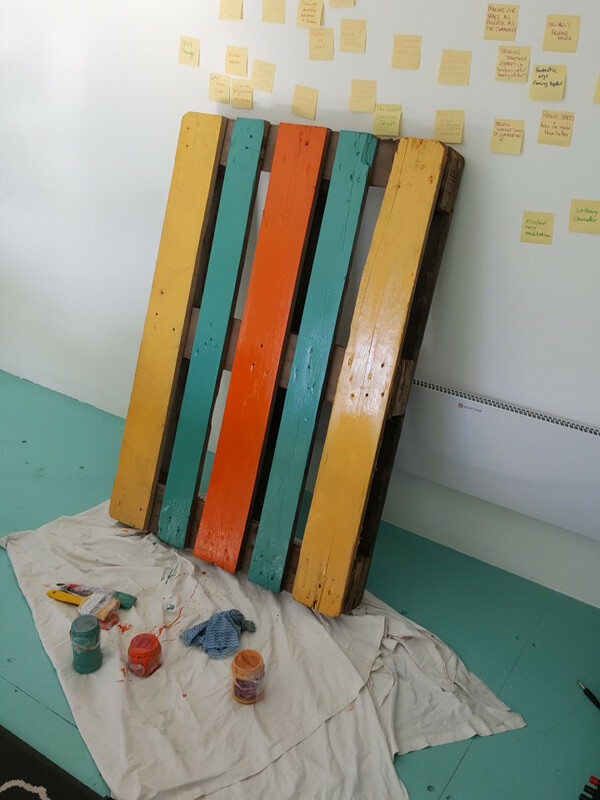 More upcycled and recycled wood! To what we hoped was a striking design using the precinct colours, which are symbolic of the three different areas of the precinct this event brought together — yellow (eat: share food, drink and conversation at the cafe), turquoise (connect with the community), and orange (create, used in the ArtSpace). Arguable there was plenty of reflection happening as well, both during the poems and after as they resonated through the evening. We hope to see you at one or all!